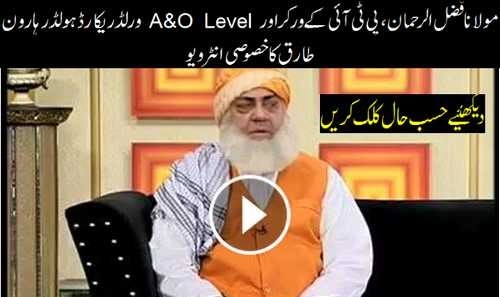 Watch Dunya TV Hasb-E-Haal Latest Episode 21st February 2015, Azizi as Mulana Fazal-ur-Rehman, Discussion on different news, discussion on current bad condition of Pakistan cricket team in world cup 2015, O-level and A-level world record holder Haroon Tariq and Interview of "Mulana Fazal-ur-Rehman and PTI's emotional worker". Hasb-e-Haal is the infotainment program broadcast by Dunya TV Pakistan which is widely watched in local and international community of Pakistani's. Watch Hasb-e-Haal with Najia Baig, Sohail Ahmed as Azizi and Junaid Saleem.